Although they are beautiful accessories—and can be worn as a piece of mindful jewelry meant to bring you a sense of peace and wellness throughout the day—mala beads are also powerful tools that have been used for thousands of years to aid in meditation and mindfulness. And when you use them to set intentions, mala beads can take your meditation and manifestation practices to an entirely new level. So how do you set intentions with your mala beads? First, let’s start by defining what intentions are. According to Deepak Chopra, “Intention is the starting point of every dream. It is the creative power that fulfills all of our needs, whether for money, relationships, spiritual awakening or love.” Simply put, intentions are statements we create that help guide us to think, feel and act in a way that brings our goals—our soul’s deepest desires—to life. And because intentions are even more powerful when you release them to the universe, using mala beads to set and represent intentions is a useful step toward manifesting them into existence. When coming up with your intentions, it’s helpful to really take the time to think deeply and honestly about what it is you want to manifest, whether that’s a physical or spiritual desire, or even a particular way you want to feel. Try meditating, sitting in silence or journaling to tap into your true desires and intentions. I intend to open my heart and mind to new people and experiences. I intend to show more compassion to myself and others. I intend to live with a mindset of abundance, knowing that I already have everything I need. I intend to let go of anxiety and insecurities, and channel a feeling of peace and calm. After you’ve determined your intentions, physically write them down. Grab a scrap piece of paper, your computer or even a dedicated intentions journal; it doesn’t matter what you use to document them, all that matters is that you have a written record of your intentions that you can revisit from time to time—especially when you need a reminder of why you set that intention in the first place. Once you’ve chosen your mala necklace or bracelet, sit with it in a quiet room or your meditation space, holding it in the palm of your hands. Bring your intention to mind, letting it fill your thoughts. Visualize it completely, and even say it aloud a few times if you’re comfortable. Open your eyes and put on your mala, carrying its intention with you throughout the day. Now every time you wear it, touch it or even look at it, you’ll be reminded of the intention you set with it and can focus your efforts on bringing that intention to life. It’s also important to meditate on your intentions on a regular basis. Bringing your focus to the intentions helps you put them out into the universe and manifest them, and keeps your soul’s desires in the front of your mind, rather than letting them get overwhelmed by everyday life. When meditating on a specific intention, have your mala nearby to help harness its manifesting powers and embody the intention that you set with that mala. Once you’ve fulfilled your intention or it no longer serves your soul’s purpose, feel free to reprogram your mala with a different intention, using the steps above. And that’s it! 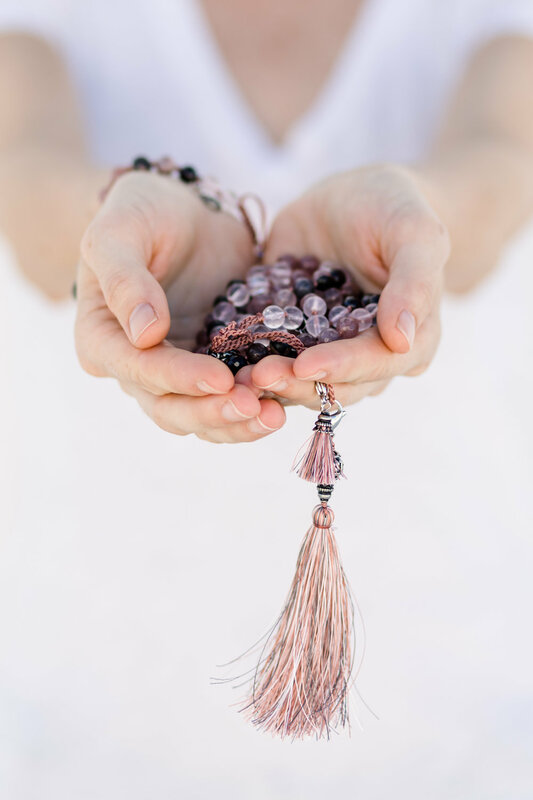 Setting an intention with your mala truly is simple, but is an incredibly powerful way to help bring your desires and goals to life.